An old newspaper clipping tells the story of John Guthrie, one of the Guthrie clan of Ray City, GA and brother of Effie Guthrie Knight. 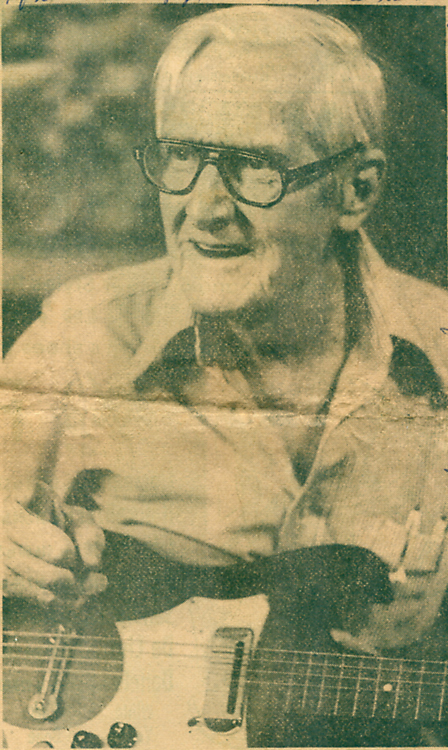 RAY CITY – It was another typical Ray City weeknight with lots of pickin’ and grinnin’ coming from the back room studio of John Guthrie, country storekeeper and musician extraordinaire. Guthrie is a local music legend, dating back 20 years and more when he would teach public school classes of 30 kids – some tone deaf – to play guitar. Musicians from hereabouts, nearby towns like Lakeland, Valdosta and Adel, gather nightly in Guthrie’s cozy studio – a slightly oversized room crammed with instruments, especially guitars. Other folks come too; they want to listen and learn. Guthrie teaches “all fretted instruments and saxophone,” his card says. But he has strict rules, “teaching only on Saturdays and Sundays. And I won’t teach a kid to play piano. They can’t reach an octave,” he declared. Guthrie figured he could have easily made the big time long ago… if he had been willing to turn his back on his beloved Ray City and south Georgia. “This is the best place in the world,” he exclaimed. It was the tug of Ray City friendships which brought the native son home from a couple of years of drifting with different bands through Florida. Those were lean times, Guthrie recalled, back during the Depression. More than once he earned a free supper by masquerading as Jimmy Rogers, a country and western pioneer referred to “as the grandfather of folk music” by Guthrie. People believed Guthrie when he introduced himself as Rogers whose plaintive ballads seemed to help sooth the Depression’s wounds. “I’d play and sing. It wasn’t anytime before we’d get a big crowd around. Someone would come along and ask me home for supper,” he recalled. Guthrie considers himself a very honest man. But those tough days put rigorous demands upon a young musician. Conveniently, Guthrie had mastered the guitar by playing along with Jimmy Rogers recordings on an old windup Victrola. Guthrie explained he could have stayed with the band. Several friends did make it to the big time, finding spots in the Nashville scene or with television or radio. Although the days of “all night dances” had an appeal, Guthrie explained he needed something more stable for when he got married. But a pretty South Carolina girl, vacationing in Winter Haven, Fla., derailed Guthrie’s career plans. “She smiled at me while the band was on intermission. I went over and we had a talk,” he recalled. Actually it was several years before Guthrie and the young woman from Chesterfield, S.C. married. She returned home, but they corresponded. “Then one day I went up and got her and brought her back to Ray City,” he said. “But an old Spanish guitar is my second love,” he said. Guthrie loves country music. But he also plays classical, Spanish, Mexican and gypsy style guitar music. Contemporary music, he said, is based upon three chords. “There’s too much repetition,” he complained. In his troubadour days, John hung with the ‘Genteel’ set. While all his brothers wore overalls and worked the farm, he wore a white sports coat and worked the dance halls and social events. But later, he worked hard running a business and working in music to support his family.